neropepe: Table Pebbles SOLD OUT, ready for orders! 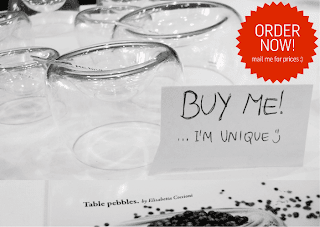 Table Pebbles SOLD OUT, ready for orders! Table Pebbles sold out at the Designboom MART in Stockholm Furniture Fair! It is now possible to buy them in Asplund Stockholm Store, in Girona at Mas Homs and a few retail shops in Italy. Retail shops, gift seekers and whoever would like to own one or more Tabble Pebbles is welcome to place orders directly by sending an email to elisabetta.coccioni@gmail.com. Soon avaiable on Etsy as well! Table Pebbles are spice holders! A Pebble can be used alone, but is meant to be used as part of a group of Pebbles. Like pebbles of a river they are of different sizes and shapes and, depending on the way they are placed, make different visual impacts. Spices are airy and colourful and lie gracefully on the pebbles. Due to their organic shapes and the transparency of clear glass the light plays gently with the spices showing nice colour marks and fascinating light effects on the table. The pebbles float naturally around the table integrating with all kind of different contexts: from the exotic Indian dinner, the elegant French wine tasting to the most continental English breakfast.